The Memory Factory introduces an English-speaking public to the significant women artists of Vienna at the turn of the twentieth century, each chosen for her aesthetic innovations and participation in public exhibitions. These women played important public roles as exhibiting artists, both individually and in collectives, but this history has been silenced over time. Their stories show that the city of Vienna was contradictory and cosmopolitan: despite men-only policies in its main art institutions, it offered a myriad of unexpected ways for women artists to forge successful public careers. Women artists came from the provinces, Russia, and Germany to participate in its vibrant art scene. However, and especially because so many of the artists were Jewish, their contributions were actively obscured beginning in the late 1930s. Many had to flee Austria, losing their studios and lifework in the process. Some were killed in concentration camps. Along with the stories of individual women artists, the author reconstructs the history of separate women artists’ associations and their exhibitions. Chapters covering the careers of Tina Blau, Elena Luksch-Makowsky, Bronica Koller, Helene Funke, and Teresa Ries (among others) point to a more integrated and cosmopolitan art world than previously thought; one where women became part of the avant-garde, accepted and even highlighted in major exhibitions at the Secession and with the Klimt group. 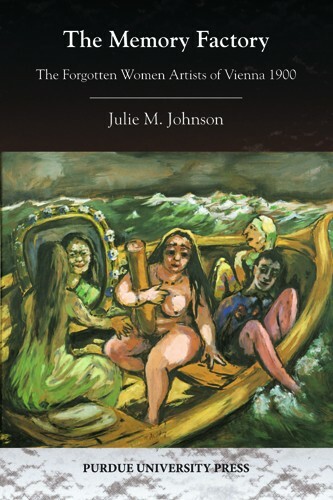 It’s remarkable that recent scholarship can force significant reconsideration of an artistic culture as well-studied as that of Vienna around 1900, but that’s what Julie M. Johnson’s work has done. As such, it will be required reading for anyone interested in Vienna’s turn-of-the-century art and art institutions, particularly the schools and the artists’ associations and unions – which functioned much as today’s artists’ collectives and artist-run spaces. It is also an important contribution to women’s studies and to the historiography of art, for it documents a group of women artists who were active in Vienna’s art world around 1900 but were entirely written out of later historical accounts. Based upon intensive archival research, Johnson demonstrates that, unlike the better-studied situation in Paris, women in Vienna had access to art education, and while they were barred from official membership in the major artists’ unions, that didn’t keep those same groups from exhibiting their work. . . . Johnson devotes serious attention to critical discussions about women artists and the problem of their place in the established story of patrilineal artistic development. She is equally interested in the erasure of their history after World War II, and makes use of recent scholarship about memory to analyze how a group of artists so broadly involved with Vienna’s artistic life around 1900 could be forgotten. . . . Purdue University Press is to be congratulated for publishing this book through its series on Central European Studies. It is extensively illustrated with works by the women artists and their male colleagues as well as with many valuable views of exhibition installations, showing the women’s work in situ. In The Memory Factory, Julie Johnson digs into the archives to reveal an astonishing picture of these women artists thriving in fin-de-siècle Vienna. . . . Johnson writes crisply with none of the pretensions common in academia and progresses neatly between telling the individual stories of five women artists (Chapters 1-5) and examining in greater detail the culture in which they first flourished and were later obscured (Chapters 6-8). llustrations of paintings and sculptures, distributed generously throughout, inject life into the stories behind them.